California Sports Surfaces (CSS) are delighted to announce that Plexipave® UK Ltd have been rewarded for their stellar application of a Plexicushion® project in Belfast, obtaining the Two-Star ITF recognition in the process. 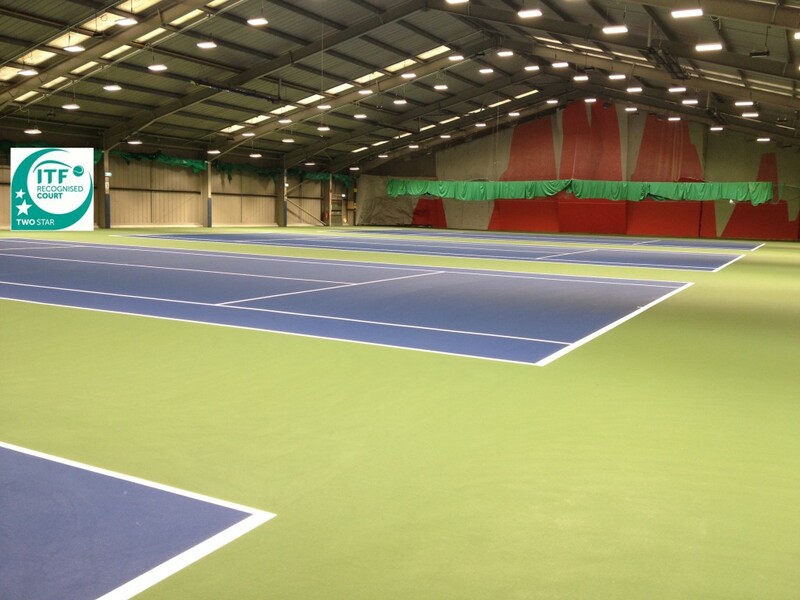 Working in conjunction with Tennis Ireland & Belfast City Council, the Ozone Tennis Centre in Belfast, Northern Ireland had four indoor tennis courts resurfaced and was completed on time for the centre to re-open in January as part of a major refurbishment programme. ITF Recognition is an acknowledgement that a court meets the recommendations provided in the ITF Guide to Test Methods for Tennis Court Surfaces, and is targeted at those venues where the standard of play demands the specification of precise playing characteristics. To obtain Two-Star ITF Recognition, the average Court Pace Rating of the court must be within five points of the ITF Classified value for the surface product in addition to fulfilling the requirements for One-Star Recognition. Plexipave® is an acrylic, multi-layer coating system with each layer contributing a specific quality to the whole and it is engineered to provide the optimum surface in terms of performance, consistency, durability and maintenance. Plexicushion® is the big brother of Plexipave® and contains layers of liquid rubber in addition to the Plexipave® system, providing increased player comfort. Tennis Australia has chosen the Plexicushion® system for the Australian Open since 2008, whilst Plexipave® is also used for many worldwide ATP & WTA events. The Belfast Ozone centre is not alone in choosing Plexipave®. It is proving to extremely popular throughout the UK, with recent installations including courts for Bath University, Nottingham Tennis Centre, Edgbaston Priory Club, Queens Club, Batchwood Tennis Centre & The West Hants Club in Bournemouth. This entry was posted in Plexipave®. Bookmark the permalink.